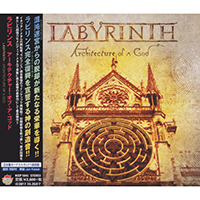 The Labyrinth - Architecture Of A God (Japan Edition) album begins with a wave of symphonic artistry, enveloped in vortexes of cosmic currents - mysteriously hiding the development of stylistic hues. Then the Bullets introduction ends with a short wave of drive, but then soft artistry intertwines with musical eagerness, supporting dreamy phrases of vocal narration, intertwining them with exciting musical passages, decorated with symphonic keyboard notes. In the instrumental part, the artistic symphony fascinates with musical delights, culminating in an inspired chorus. The proud and dense introduction ends with thoughtful vocal reflections, then weaving into a very interesting Still Alive composition that continues the very artistic presentation of the album. In the chorus, the main motive rises in an incredibly exciting melody, in the instrumental part, keyboard motifs dominate the musical image. Removing marvelous cosmic motifs Take On My Legacy seeks to bring a wave of impetuous drive, but melodic motifs rise in instrumental bridges, enveloping the rest of the passages with bright and artistic additions. Beginning with a gentle romance with thoughtful vocal reflections A New Dream in the bridge, a bright whirlwind of artistic musical passages, shrouded in rays of unknown stars, whips up. Further, the song turns into a combination of a ballad and a medium tempo composition. The inspired mid-tempo Someone Says song envelops the perception with a wonderful melody of the main motive, approaching the ballad narration of a wandering bard in verses, erecting bright tangles of marvelous laces of exciting melodism in the choruses. The muffled vocal confession is intertwined with the mysterious piano passages, bringing the vague perplexity to the forefront of a brief Random Logic suite, introducing the title composition Architecture Of A God, erecting mysterious covers of divine fabrications, extolling them first in a wonderful soft romance. Then, in the song, there is the exciting influence of the motifs inherent in the steve, complemented by the fabulous artistic manner of the album. Expanding the stylistic framework of the album Children (Robert Miles cover) takes by mysterious instrumental suite in the distant distance, bringing the spirit of wandering and adventure. The romantic atmosphere captivates with Those Days exciting ballad, enveloping such soft and seductive laces of a melodic symphony, raising romantic reflections on incredible transcendental heights. Preserving the ornament of progressive melody We Belong To Yesterday complements the album with a wave of drive into the intro, then returning in a verse to fascinating romantic reflections, but again throwing around with an exciting, bright stream of charming drive. Oh! Many lacked the swiftness and impetuousness of the power metal musical style - Stardust And Ashes returns the expected features to the album, but retaining, however, the fascinating melody and artistic outlines of musical images, most clearly manifested in the instrumental part of the composition. The album is completed with ballads full of peace and romanticism - at first Diamond overwhelms the surrounding space with the mysterious artistry of keyboard motifs, enveloped in obscure glitter of mysterious images. Then Those Days (acoustic version) transforms one of the compositions of the album into a softer, delicate and fascinating interpretation.